If at first you don’t succeed, try, try again…to build another social network around users’ recent shopping purchases. 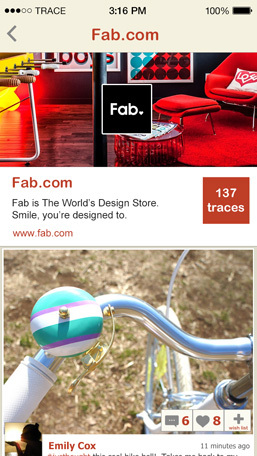 Trace is the latest startup to give social commerce a go, with a new iPhone app, launching now, which allows users to share what they’ve just bought with a network of friends. Today, Instagram users will sometimes post their recent shopping purchases as an expression of joy over a new find (or bragging, if they’re rich kids). And Pinterest users like to collect items they plan to buy later. But Ryan Stevens, Trace founder and CEO, thinks photos of your favorite new things deserve their own, standalone destination. It’s an idea that’s been tried before. Sound familiar? If not, you must be new here. The idea for a shopping-based social network of sorts has been tried in the past, most prominently with Blippy, a failed startup that dug into users’ credit card purchases to find their purchases and share them. Users were hesitant to provide their credit card details, though, and when dollar amounts are involved, sharing purchases feels a bit gauche. Then, more recently, a startup called Mine used an email importer to perform a similar task. Stevens, along with co-founder Sudhir Navalapakam, got started on the idea for Trace a little over a year ago, following their stint at now-shuttered mobile payments service ZipPay. At ZipPay, they noticed then that a number of users were already sharing their purchases out to other social networks, like Facebook and Twitter. “We started talking about ways to make that a better experience for them,” says Stevens. For the past 14 weeks, the app has been in private beta testing with around 1,500 users. Predominantly, the crowd is young, professional women, generally post-college grads now with a little extra income to spend. As for the app itself, there’s a familiar user interface involving a way to post and tag a product photo, a feed, a favoriting option, a friend finder, some suggested users to get you started, and a way to browse and explore through various categories. Photos can also be shared out more broadly to Facebook or Twitter, and they do have their own dedicated, though not fully fleshed out, web pages which could later become the basis for Trace’s web version. The app itself is pleasant enough to use, but it’s going to be tough for it to truly differentiate itself from other social commerce applications already out there. Though it’s focused on a user’s own purchases (at least in theory), more people are drawn to services like this not for the content creation aspects, but the consumption – that is, to see what others have shared. They browse Pinterest looking for ideas, or check out what’s trending on Wanelo or Svpply. Meanwhile, they’re still connecting with friends on Instagram, and shopping on a number of modern e-commerce sites on web and mobile, which have “popular” feeds of their own. But Stevens though thinks there’s still room for something that’s solely focused on purchased items, and the resulting conversations around them. His team is working with bloggers and video bloggers (especially those doing the “haul videos“) to establish Trace’s core user base, he says. The company has a small amount of seed funding ($250K) from Kae Capital and Tandem Entrepreneurs. They’re currently working out of Tandem’s auxiliary offices in Burlingame, California, after a fire destroyed Tandem’s main offices over the holidays. Fortunately for Trace, nothing was lost as they were working out of Hacker Dojo just before, and hadn’t yet set up shop. (Other teams weren’t so lucky). Trace is a free download, here on iTunes.